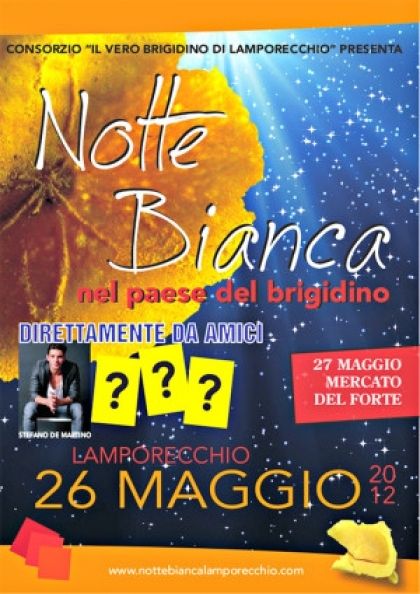 White Night” in Lamporecchio tomorrow, Saturday, May 26. 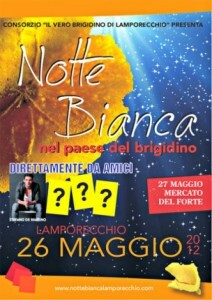 The country’s brigidino invites us to a big party. From 8 to 20 hours a market is held. Also present LAILAC, the Japanese Cultural Association. Among the many events planned ‘Hello Lucio’ concert in memory of Lucio Dalla Iskra Menarini, a caravan of street artists ‘dragged’ from the artistic director Franco di Corcia Junior and lovers of the smooth concert Madonia. For sports fans there instead of ‘Great Palio of the Ring’ with the participation of many local athletes as Pacini and Lazzeretti. At midnight the show ‘Lanterns show’ enlightens the White Night True Brigidino organized by the Consortium, Academy Sanremo and Production ‘Thoughts of Bo’.